HAVE YOU EVER WANTED TO LEARN HOW HIT SONGS ARE MADE IN MUSIC CITY? JOIN NASHVILLE RECORD PRODUCER TYLER CAIN TO EXPERIENCE IT FIRST HAND! 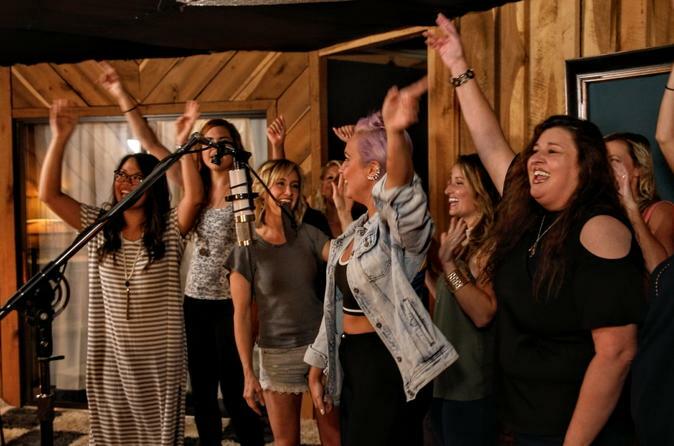 For a once-in-a-lifetime experience, enter a working Nashville Recording Studio, where renowned producer/artist Tyler Cain (whose credits include working w Big & Rich, Darius Rucker, Billy Currington, and more) will give you a first-hand participatory look at the real Nashville music scene. You'll learn how recording works, hear a couple classic recordings like you've never heard them before and even get to step in front of the mic & sing during a group song that'll be recorded & sent to you! There's so much history in the walls of Bold Studios. Every detail of this magical space will captivate you; from the glittery walls to the antique light fixtures, light up Music City sign and vintage church pews. There’s a photo opp around every corner! You’ll even enjoy strutting your stuff on the NST Red Carpet! You will be guided on this unique interactive tour by an experienced, professional Nashville Record Producer/Songwriter at Bold Studios Nashville. Learn how a recording studio works in Music City and hear behind-the-scenes stories and history about Nashville’s famous music scene. Then you will actually be recorded as you sing a group vocal, and an mp3 of your group recording will be e-mailed to you! But don’t worry, no musical skill is necessary. Lastly, like the star you are, you will walk the Nashville Studio Tour Red Carpet where you can take pictures to show your fans back home, while they listen to your mp3 Nashville recording! There is so much history in the walls of Bold Studios. Numerous artists have recorded here including Trace Adkins, John Oates (Hall and Oates) Aloe Blacc, Ashley Monroe and many more! Every detail of this magical space will captivate you; from the glittery walls to the antique light fixtures, light up Music City sign and vintage church pews. There’s a photo opp around every corner! You’ll even enjoy strutting your stuff on the NST Red Carpet!